Michael Mazière is an artist and curator. He studied Photography and Film at Nottingham Trent University and the Royal College of Art. He is currently Reader in Film & Video at the University of Westminster and curator of Ambika P3 and London Gallery West. Before joining the University, he was a research fellow at the British Artists' Film and Video Study Collection at the University of the Arts, London. Previously he was Director of the Lux Centre, London Electronic Arts and Pandaemonium - London’s Festival of Moving Images. 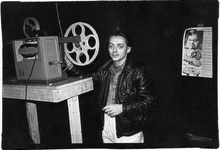 He also worked at the London Film-makers Co-operative as cinema programmer and editor of Undercut film and video magazine. His films are exhibited internationally in galleries, museums and festivals and he writes regularly on the subject of artists’ film and video. He has completed an anthology of writing on artists film and video for Wallflower Press and his latest work ‘Actor’ continues his exploration of cinema and memory.